The best recurve bow doesn’t have to break the bank, and it should break your arm when you draw back the string. There are a lot of factors to consider, and we’re going to cover them all and provide you with a short list of the top options around. Traditional and powerful, a recurve with Hungarian style. An excellent set for beginners with everyone you need in the box. Full-sized and budget-friendly with lower draw weights. Do Recurve Bows Come Ready To Shoot Right Away? Archery is one of the oldest sports around, and it’s also the way our ancestors fed their families. Whether you want to rapidly fire arrows like Lars Anderson or take out a 12-point buck, the best recurve bow can handle either task with ease. Compound bows are nice, and everyone loves a cool crossbow, but you might be surprised by what a modern recurve bow can do. If you’re looking for something unique, we’ve got that covered as well. Check out our quick guide to help you find the perfect new bow. When you’re buying a new product for the first time online, it can be difficult to learn who to trust. Paid shills abound, so finding a solid review can be like pulling a needle from a haystack – especially with recurve bows. While I’ve never bagged an animal, I have unleashed thousands of arrows and broken hundreds more. You’re going to learn a few things from my mistakes, and our experts put the top models through a lengthy review process. We considered everything from the number of bushings to the lack thereof. We looked the types of woods used to be sure we’re being thorough. We also included a few traditional models if you’re feeling historical. We have price points and styles for archers both big and small. When you’re in a rush or have a trip planned, you may need to pick up a bow in quickly. If speed is critical, you’ll want to key in on the size of the bow and the draw weight. Length is important, but the draw weight tells you how hard it’ll be to pull back the string. Your handedness comes into play as well. Righties will want a right-handed bow which you actually hold with your left and draw with your right. You’ll also need to consider accessories including a bow stringer and arrows although we have a quick guide that will lend you a hand if you plan to hunt. The big difference between a recurve bow, and a traditional one are the limbs. 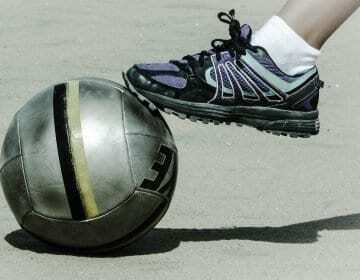 When unstrung, you’ll notice they bend forward, a design choice which helps generate extra energy. They work just like a longbow or reflex bow, however, and are easy to shoot whether you’re a beginner or a seasoned pro. Are you a beginner picking out your first bow or seasoned hunter with years of experience in the field? Hunters capable of dropping a deer at 20 yards with ease may want to skip ahead to our top options. If you’re just getting started, you’ll want to hang with us as we’ll cover everything from draw weight to accessories you can’t do without. Are You Hunting Or Is It A Hobby? The first step to choosing the right bow is thinking about how you’ll use it. You can shoot at targets with any type of bow, but you can’t take down a buck with a practice bow that has a low draw weight. 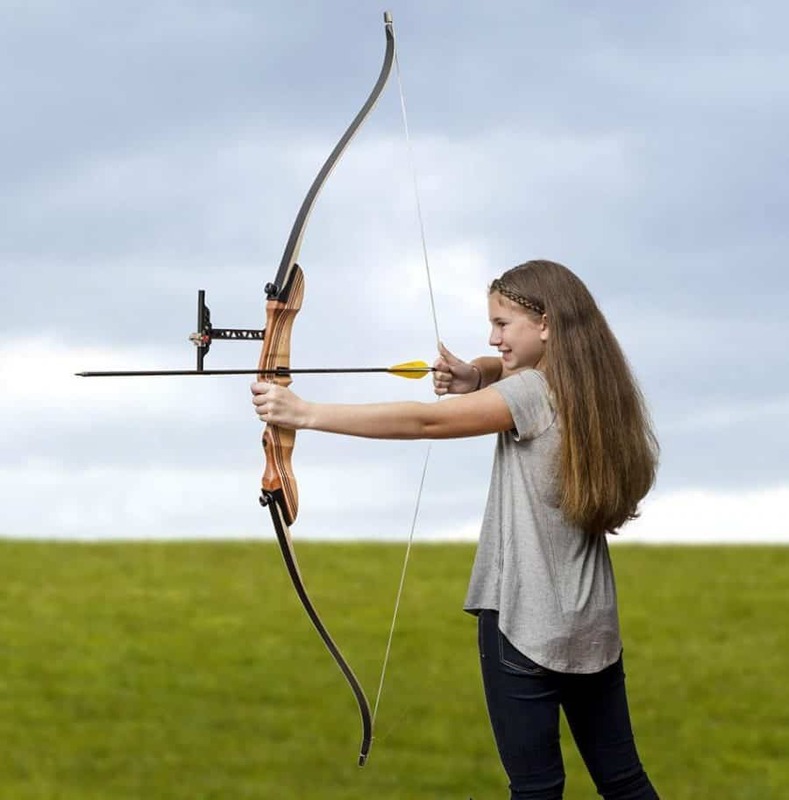 If you plan to try archery as a sport, you may want to consider a target bow or cheaper model. These bows tend to be more affordable–something important for beginners as buying a bow is only half the battle. This fun hobby can quickly get expensive when you start snapping arrows and picking up accessories like carbon sights or reel kits. Aside from price and the quality of the materials used, there aren’t too many differences between these two types of bows. Practice bows can be a bit longer in some cases and may have a more colorful design, but the weight ranges typically stay the same. 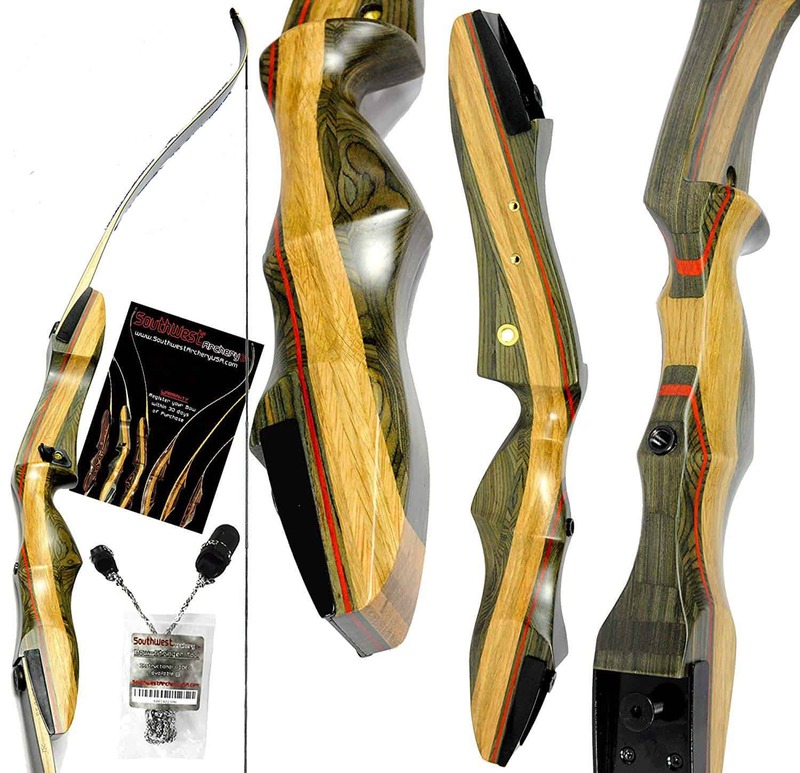 In the world of recurve bows, you have two main choices with a one-piece or traditional bow or a take-down model. Both models look basically the same, but there is one key difference. Any takedown bow will have bolts or “limb pockets” which let you remove the limbs. This is ideal if you want to change the draw weight or length on a whim. They are also easier to transport considering they break down, so you can stow them in a pack with ease. Durability is a hot topic of debate between these two styles as some archers feel one-piece bows break more frequently than takedown bows. On the flipside, some believe the traditional design is sturdier when high-quality materials are used as there is no weak point where the limbs attach. While you can find an excellent recurve bow in both forms, we feel takedown models provide more value. The ability to change a cracked limb or increase the power is hard to beat. They’re cheaper than traditional models in most cases as well. Riser – Think of the riser as the backbone of your bow. It’s also where you’ll place your hand and is usually made from wood if you’re choosing a traditional recurve bow. If that’s the case, pay close attention to the riser as you can’t change it later – it’s fixed to the limbs.With takedown bows, the world is your oyster. Wood is still a popular option and ideal when layered with other materials as it gives you strength and is warmer than something like aluminum.The riser is also where attachments come into play like sights, a stabilizer, or even a fishing reel. If you love accessories, look for pre-tapped risers with bushings. You can always add them with a drill and some ingenuity at a later date, but it’s easier to let the manufacturer take care of that. Bow Shelf – The shelf is usually built onto the riser and gives you a place to rest your arrow. It’s a small edge that’s generally plain wood on basic bows, but can be covered in various types of materials as well. Bear hair is a popular option, but the shape of the shelf is critical as it can affect the flight of your arrow.Bows in this class usually have a shelf with a radius or one that’s completely flat. A radius keeps contact between the shelf and the arrow at a minimum, but not as much as a “ridged” edge which has a bit of a point. If the bow is flat and you want more clearance, you can always make adjustments using leather or felt without altering the bow itself. Limbs – Limbs are interchangeable on takedown bows and are directly tied to the weight. While that number varies, key in on the materials, they’re made from and just how well they are made.Construction and the types of materials used will affect the “feel” when you let your arrows fly, but the tips can to limit the kind of string you can use. If you want the ability to use almost any type of string, look for a bow with reinforced limb tips.Wood with fiberglass facing is the most common style these days, but carbon fiber and other exotics have slowly made their way into the mix as well. Some even have cores filled with bamboo or synthetics if you truly want the best or just something unique. Limb Pocket – This is the part of the bow where the limbs attach or join the riser unless it’s a one-piece bow. The style varies wildly and so do the widths although there are a few manufacturers that have interchangeable limbs – in this case, SAS and Samick Sage.How the limbs attach is important as well. Most use a hex screw and require a key or wrench when it’s time to tighten things up or switch weights.If you’re in the field, that can be a pain and tools are easy to lose (you could try one of these!). Alternatively, there are a handful of models which use a tool-less system with small knobs similar to what you’d see on a weight bench. String – No matter how well built your bow is, you won’t get far without a good bowstring. Unless you’re buying a top-tier model, you’ll probably have a Dacron string. They are popular, affordable, and get the job done, but aren’t as “snappy” as other alternatives. That’s because they stretch a little more, so they’re better suited for wooden one-piece than a high-draw takedown bow. Kevlar-based strings are stronger and have less stretch. But put more strain on the limbs of your bow. The amount of strands used is directly tied to the weight, but there are other things to worry about like creep or why wax is good, be sure to check this out. There are several other parts of the bow you’ll need to familiarize yourself with; this diagram explains things far better than we ever could. There are two types of “Draw” measurements you’ll need to learn in the archery world, but one is far easier to figure out than the other. That would be draw length, which correlates to the length of the bow and how far back you can pull the string. 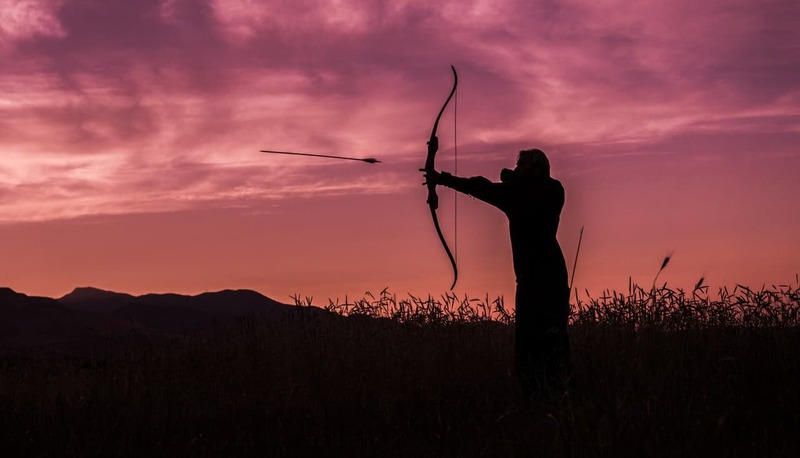 It’s critical if you want to perfect your form, fire arrows correctly or just keep the string from popping your jacket (or wrist) with every shot. Unfortunately, many manufacturers leave this detail out although 28-inches is the standard for most of the recurve bows we examined. If you want to learn how to measure your draw length without a bow, this explains things nicely. Draw weight doesn’t refer to the weight of the bow, but how much power it can deliver when you let that arrow fly. 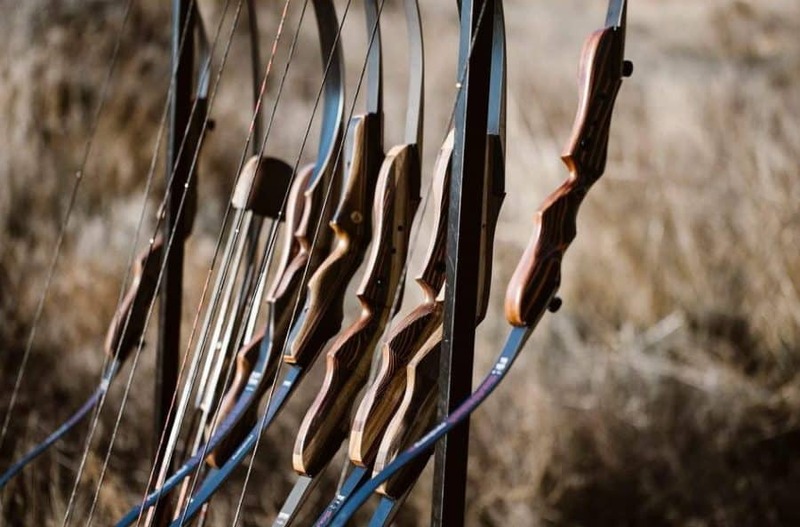 When looking for the top recurve bow, it’s also the first number you should consider if you plan to hunt or are new to the sport. If you’ve never used a bow and arrow before, you’re not going to have a clue about draw weight. While a 60-pound pull may sound manly, you may tire yourself out after a few shots or have to switch the limbs out sooner than you’d like. Unlike compound bows or crossbows, you’re going to have to “hold” the weight once you pull it back. While there is no perfect weight for beginners, you’ll want to start low and work your way up. For average sized men, we recommend a weight of between 35 to 45 pounds depending on your needs. Obviously, if you have a larger frame or are built like a tank, feel free to choose a higher draw weight. 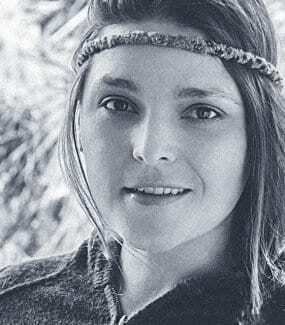 Most ladies will be comfortable in the 20 to 35-pound range while bows built for younger archers are usually between 15 to 25 pounds. It’s also where things can get extremely tricky as regulations can vary from state to state. For example, in Ohio, you can drop a Coyote with anything from a recurve bow to a pistol or even an Airgun if you’re the reincarnation of Jim Corbett. On the flipside, in Oregon, you’ll need to have a draw weight of 40 pounds for any type of game and 50 or more for Elk. Live in South Carolina and like to bow hunt? There are virtually no restrictions there, but archers in Colorado will want to make sure they read everything carefully before heading off to take on big game in the wilds. In a nutshell, if you plan to hunt with your bow, check out the rules and regulations for your state beforehand. Otherwise, you could end up with an underpowered recurve bow or an expensive accessory that’s illegal in your locale. Do I Need A Right Or Left-handed Bow? Choosing the right hand to hold a bow with may sound simple, but it’s not if you’ve never nocked an arrow. The first thing you need to do if you’re unsure what type of bow you need is to decide on your dominant hand. That’s the hand you write with, otherwise known as the “smart” hand for most of us. If you’re right handed, you want a right-handed bow. You hold these bows in your left hand and draw back the string with your right. Reverse that for left-handed archers, and you’re good to go. 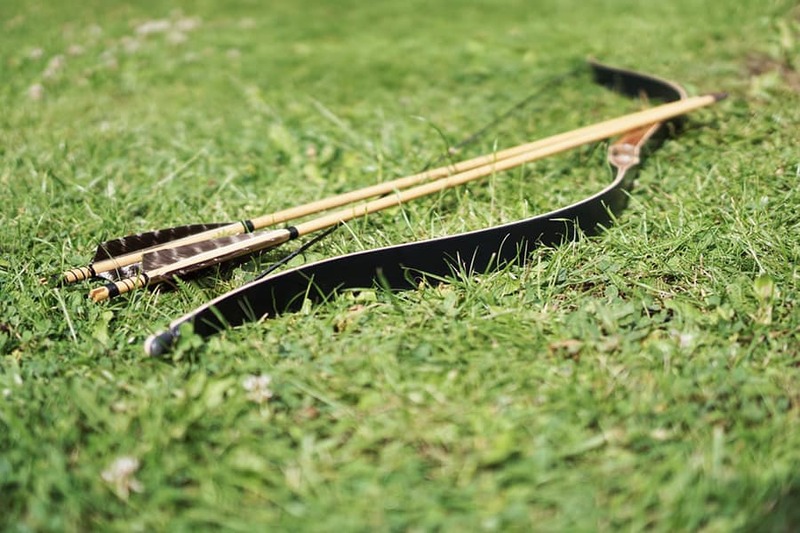 There are also ambidextrous recurve bows available which are great for archers who want to shoot with either hand, are unsure, or simply need to share a bow. Our top option comes from Southwest Archery and may look familiar. The Spyder recurve takedown bow was designed from the same minds that produced the Samick Sage, and it’s an ideal choice for beginners looking for their first bow. Like all good recurve bows, the Spyder has a layered look. The company used a blend of four woods in the riser which is topped off with red wood. It has a nice smooth laminated finish. It looks good and feels good in the hand as well with rounded edges. If you’re used to the Sage, you may find this one to be a bit more comfortable. Users of the bow seem split down the middle, but most feel its an improvement. The riser has a series of threaded bushings, so you can slap a stabilizer on the Spyder in seconds or set up your favorite biscuit rest. If you want to shoot off the shelf, that’s an option as soon as you crack open the box although they’ve included a stick-on solution as well. As or the limbs, they are maple and sit inside limb pockets on the riser. Fiberglass reinforcement provides the flex, and the tips are reinforced. You can use both Flemish and Fast Flight strings on the Spyder, and we like the fact the hex bolts are almost flush with the surface. The limbs are 100% interchangeable with other risers from Southwest Archery aside from the Little Tiger. What about the draw weight? One reason we feel the SA Spyder Takedown is perfect for beginners are the draw weights. While a variety of weights are common, this one runs from 20 to 60 pounds which covers men, women, and teenagers. You can start out with a low weight set of limbs for practice, and quickly switch to a heavier weight for hunting without breaking the bank. While we love this bow, you'll want to pay close attention to the model you choose if this is your first one. Unless you pick a bow packaged with a stringer tool, you’ll need to have one to get started although we’re pleased to say there is a detailed guide included. The Spyder has a 1-year warranty, is available for both lefties and righties, and comes with stick-on arrow rest, hex wrench, and a 14-strand Dacron string. If you’re interested in the model, it was “modeled” after the original Samick Sage. If you prefer to take out target or game the way our ancestors did, you’ll want to have the Bear Archery Grizzly high on your list. It’s a traditional style recurve bow with no bells & whistles, but one that definitely lives up to the hype. The design has been popular since the 60s and is best suited for hunters that want the best. It’s also what’s referred to as a one-piece bow considering the riser is made from a single piece of hard-rock maple. It’s durable, and arguably the most attractive bow on our list as well. While beauty may be in the eye of the beholder, there’s no debate when it comes to the Bear Archery Grizzly’s performance. The maple limbs are grip capped with a black fiberglass face, and the bow is a bit shorter than others at 58-inches. The design and length make it easier to get through the bush – another reason it’s excellent for hunters. The Bear Grizzly is a little barebones due to its style but still has a few noteworthy extras. The shelf is covered with bear hair while the limbs and riser have a fine finish that’s resistant to the elements. In a nutshell, it’s built to last, and there is a reason the company has stuck with the same design for well over 40 years. Now for the downside. If you want a bow you can deck out with accessories, this isn’t the one for you. The Bear Grizzly is traditional in every sense of the word, so aside from a quiver, you’re out of luck with sights, reels or anything else. It does accept Fast Flight strings, however, and is available in a variety of draw weights. The Bear Archery Grizzly is available from 30 to 55 pounds in both left and right-handed models. We opted for the 35 pound variant for righties, but you left-handed archers have an option there as well. It comes with a 1-year warranty, and an arrow rest along with a Dacron Flemish Twist string. If you’re looking for a recurve bow that keeps things simple but can hold its own with high-end models, we may have the solution for you. The Courage SAS Takedown is a wooden beauty built for novices or archers ready to take the next steps. This is another 60-inch bow, but powerful considering the draw weight starts at 35 and runs to 55 pounds. While it will definitely take out a block target in the backyard, it’s more than capable of dropping larger game in the field as well. 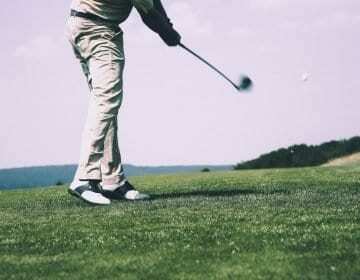 Do you like instinctive shooting? Southland Archery Supply produced a powerful bow with the Courage, and most archers felt it’s comfortable to shoot with little vibration. If you want a sight or any other type of bolt-on accessory, you’re out of luck with this one unless you’re willing to modify it. While you can still pop the limbs off, you’ll need to aim the old fashioned way as there are no extras to speak of. While not drilled, the riser looks good and is made from three layers of wood with Makor, Chugla, and Bintangor which are hard woods. As for those limbs, they are Maple and Makore with fiberglass facing. They are sturdy, but not reinforced for Fast Flight strings. If you want those, you’ll need to pick up a newer set of Spirit limbs which look the same, but range from 35 to 60 pounds. Switching limbs is easy, but you'll need to use a tool. Due to the way the limbs fit onto the riser, using limbs from another brand is highly unlikely. While there’s a lot to like about this bow, it does have a few minor drawbacks although none are deal breakers by any means. It doesn’t come with anything in the box aside from a hex wrench, instruction manual, felt rug rest, and a bow string of unknown origins. It has a stellar 3-year warranty and is available in right or left-handed variants. While a great recurve bow will let you choose a draw weight to suit your needs, most don’t let you choose a size. 60-inches is the standard, but nobody told Southwest Archery Supply that. The Tiger Takedown bucks that trend by giving you three sizes to go along with an interesting choice in draw weights. The Tiger is another bow with a style similar to the Samick Sage. It was also designed by some team members from the company but uses the lovely Tigerwood in place of the layered approach. This bow will definitely draw a few stares on the range, and the performance is top-notch whether you roll with the Tiny Tiger or the full-sized 62-inch bow. The riser is tapped so you can outfit it with any accessory you choose, but there’s one difference between we feel needs to be pointed out. In photos, you may see a model with brass bushings while others show black bushings. After reaching out to the manufacturer, we learned that only the older models have brass, and all the newer recurve bows will have black taps. The limbs are made from maple with the usual amount of black fiberglass facing, and they’re reinforced to boot. You can use Fast Flights or any string you’d like, and they’re easy to attach as well thanks to knobs. While they aren’t flush, you can leave the hex tool behind and swap out limbs in less than a minute. The draw weight depends on which model you choose. The same goes for the size. The aptly named Tiny Tiger is only 48-inches with a 14-pound draw weight but looks just like its larger siblings. The Little Tiger clocks in at 54-inches, but you’ll get a bit more variety with the draw weights. It’s still not in the hunting class however at 16, 20 or 25 pounds. Last but not least is the Tiger, which is a bit larger than other bows on our list at 62-inches. Unfortunately, the draw weight tops out at 29 pounds on this bow and dips down to 16 pounds in 4-pound increments. All are available in right or left-handed models and are as accurate as you’d expect once you get them properly dialed in. 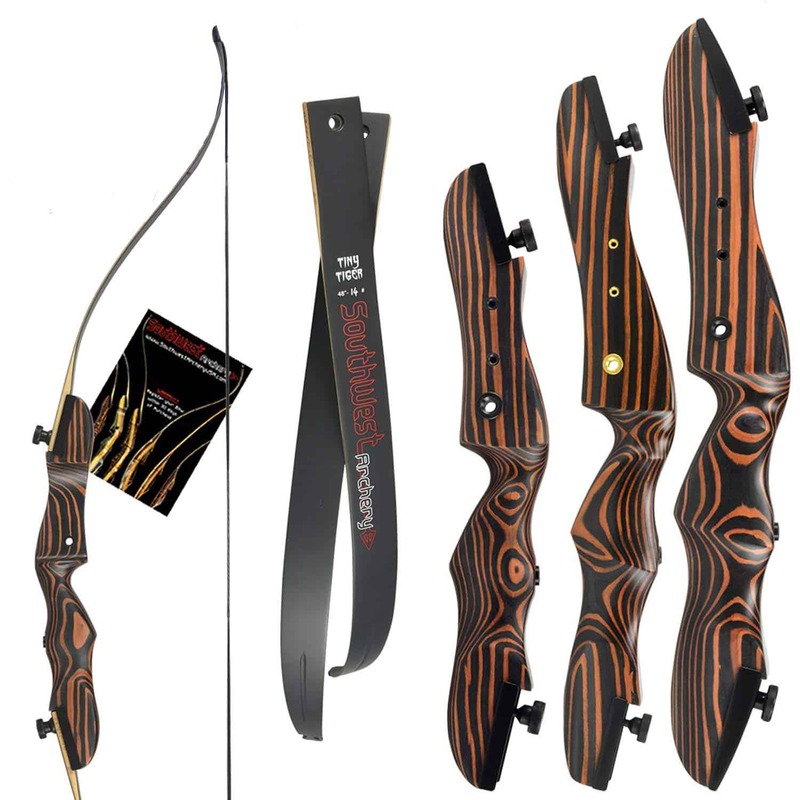 The Tiger series of takedown recurve bows are eye-catching and an outstanding option for a practice bow. They shoot well and are easy to tune in although the draw weight limits you unless you choose the full-sized model which “may” be able to take a larger limb if you find one to fit the pocket. All versions come with a 1-year warranty, a Dacron bow string, an adhesive arrow rest and instruction manual. This Hungarian style recurve bow from Longbowmaker is one of the more unique bows we’ve come across. It’s in the traditional style, and while it was initially designed to be used on horseback, it will work just as well on foot in your backyard. Whereas most of our recurve bows clock in at 60-inches, this one is 57-inches, so it’s more manageable in the woods or on a horse if you really plan to turn back the clock. While we don’t advise putting together your own horde, you’ll be pleasantly surprised by how the Flagella recurve bow performs. We couldn’t dig up any details on the types of wood used in this bow aside from Beech. It’s not 100% wood and has fiberglass in the build even if it’s difficult to tell from the wraps. Except for a few inches at the tips, the entire bow is wrapped in black leather. There’s twine in several areas around the riser and ends of the limbs although that and the design may be an issue for some. Have you ever shot this style of bow before? If so, you probably wore a glove or leather arm guard as there is no arrow shelf. That means you’ll need feather arrows as plastic fletching will rip your fingers to shreds. Don’t try and be tough, always be smart when using any style of bow and arrow. While the twine looks good and adds an extra layer of authenticity to the bow, it can also unravel. Pay close attention to the build quality out of the box with this one. 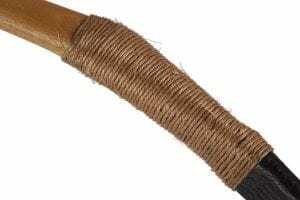 The Longbowmaker Flagella Horsebow is a budget-friendly alternative to traditional Hungarian bow, and one consumers have been enjoying for several years. It’s ambidextrous with a draw weight range of 30 to 60 pounds, so almost everyone will be able to handle this bow. Just remember to have hand protection, and you’ll want a bow stringer as well. One of the things we love about archery is the fact it’s an activity anyone can participate in. You can pick it up if you’re in your 60s or pre-teens, especially if it’s a recurve bow. The Bear Archery Titan set may be billed for the younger crowd, but it’s ideal for anyone that needs an ambidextrous bow with a low draw weight. While still 60-inches, this bow is built a bit different from the rest. The limbs are made from a composite material with plenty of flex, and there’s a molded riser grip in the middle. The arrow rest is designed to work with either hand as well. That’s a huge bonus if you have more than one young archer in your household. The Titan ensures the leftie or right-handed child won’t feel left out, and you’ll only need to buy one bow. This bow is designed for the younger crowd, so power is definitely a concern. You can clearly see it has some pop but is one of the safer alternatives and very easy to operate for children around 12-years old. Regardless of little Robin Hood’s prowess, never leave them unattended. And be ready to lend a hand with the bowstring. You can string this with relative ease if you have experience due to the draw weight and “slight” curve although it’s not something you’ll want your child trying for the first time. 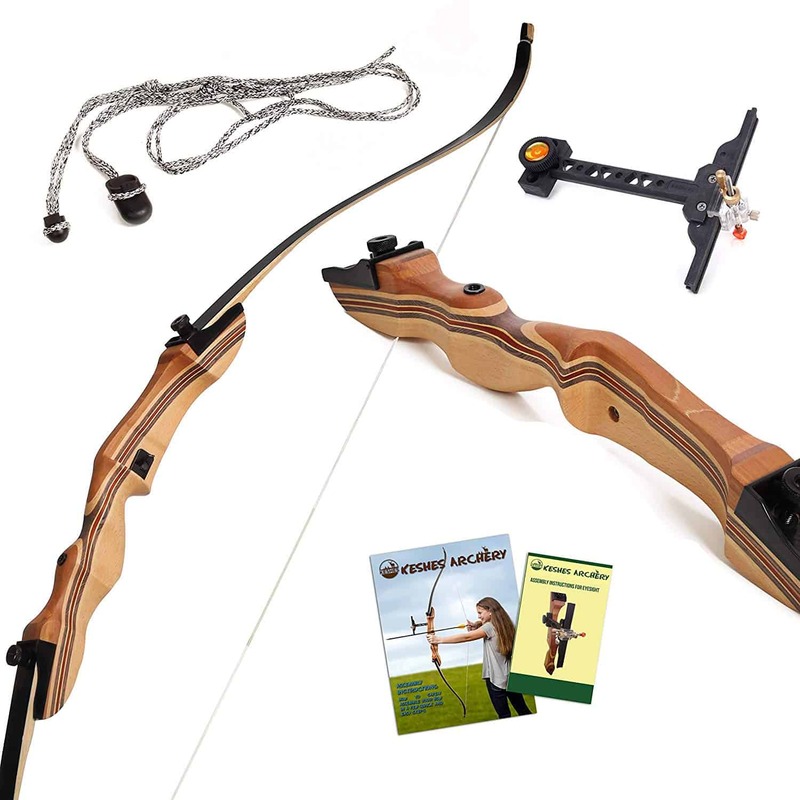 The Bear Archer Titan is available with no accessories aside from a manual and string, or you can pick up a full kit. While the accessories aren’t top quality, you’ll need them anyway if it’s a bow for a new archer. The kit comes with a finger tab, quiver, armguard, a target, and a couple of safety glass arrows. That’s more than enough to get started although we’d recommend an extra set to cut back on trips to the target. KESHES is a name that may not ring too many bells, and they weren’t on our radar until this bow was recommended by another member of our staff. It may not have a fancy moniker, but this takedown bow is solid and one of the more affordable options around. 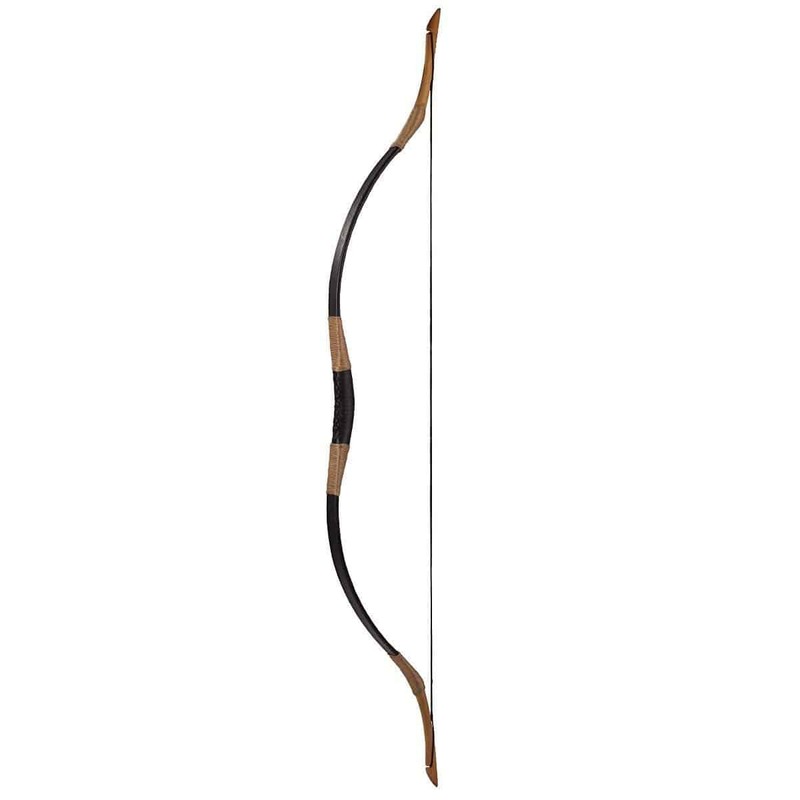 This bow is 62-inches with a layered wooden riser sporting rounded edges. The limbs don’t set in a pocket, but they do still attach or detach quickly thanks to a couple of knob screws. They aren’t flush or what we would consider sleek, but it’s a “tool-less” system, so you won’t need to keep track of a wrench. Another perk are the pre-installed brass bushings. This makes upgrades easy down the line although we can’t say the same about one area. The limbs are sturdy and wooden with a black fiberglass facing, and while you can swap them out, the company doesn’t sell add-on limbs. That should be cause for a pause if you are a serious archer or think you need to upgrade down the line. It also makes choosing the right draw weight all the more important. You can use other limbs from KESHES recurve bows, but it will be a process of trial and error. 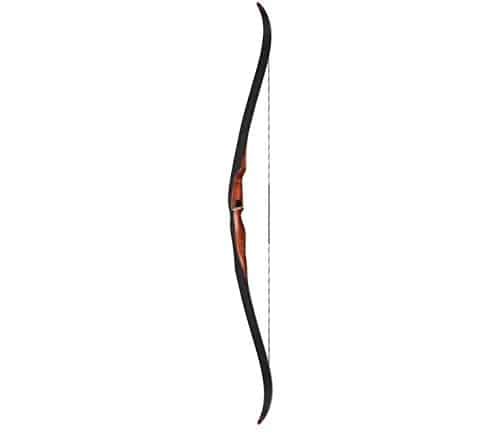 This bow is available is on the lower end of the draw weight spectrum, but available for right and left-handed archers. The power maxes out at 35 pounds and drops down to 15 pounds in 5-pound increments. While the top end rules it out for most hunters, the low draw weight is ideal for beginners or the young archers in training. While we dig this set, don’t be misled by the listing which bills it as a “Bow and Arrow.” While you’ll get the former, there are no arrows included with this particular set. 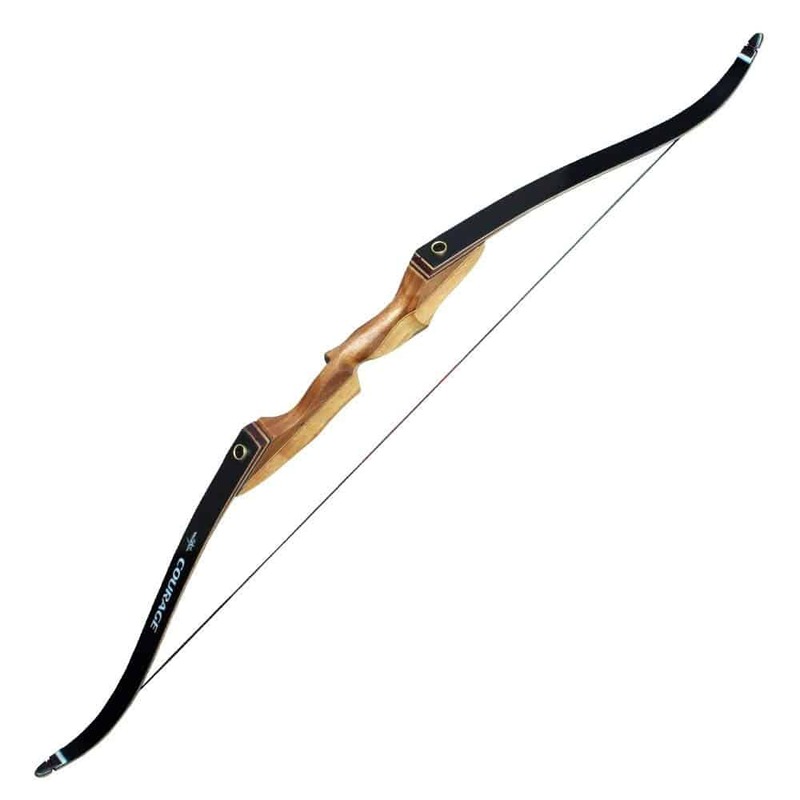 Overall, we feel it’s a great practice bow or an excellent choice for beginners given the budget-friendly price point. Just choose the draw weight carefully and don’t plan on hunting anything large. You may be able to pull firearms out of the box and go to work, but you can’t do that with a recurve bow. They don’t ship with strings attached, so you’ll need to string it before even thinking about tuning it in. While the process is fairly simple, you can bust your bow if you’re not careful and don’t read the directions. Our team has tested enough products to know those handy instruction manuals can be a hindrance at times. 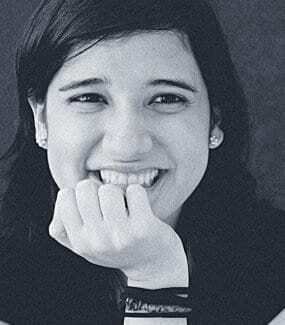 Before we talk about what you’ll need to pick up, we’ll briefly discuss what you can expect. Any bow worth its salt will come with an instruction manual and a warranty card is usually a lock. 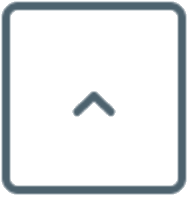 The most common option outside of those slips of paper is an arrow rest, usually of the stick-on variety. You might get a rug rest, but that’s about it unless you buy a “ready to shoot” package. That depends on the type of bow you choose, but one accessory you can’t live without is an arm guard. This protects your wrist from the bow string, something a lot of inexperienced archers will experience more than once. As a child, I had a bruised forearm for weeks from an old Indian Spirit bow so believe me when I say, pick up an arm guard. Arm guards are inexpensive and come with a vast array of styles from medieval wraps that go halfway up the arm to vented lightweight guards. Arrow rests are usually affordable as well and something we’ve discussed and a silencer can quite things down considerably for hunters. String wax is highly recommended along with other optional accessories like arrow pullers, finger slings, and quivers. If you’re using it for hunting, we also recommend you check out your options for hunting GPS units. These badboys are capable of doing a lot more than you realize–including keeping you safe. Now that you’ve found the best recurve bow to suit your needs, you’ll want to take good care of it. It doesn’t matter if it’s a budget-friendly model or high-end takedown bow, it will keep you happy for years to come if follow a few quick tips. When storing your bow, never leave it standing in a corner… or standing at all for that matter. While it’s convenient, you can damage the tips so it should be stored on a shelf flat or a set of hangers. Even if the wood is coated, wipe it down and make sure it’s dry. If it’s of the takedown variety, it’s not a bad idea to put a light coating of oil on and steel parts every so often as well, just be careful of wooden finishes. We’re not going to go into arrow maintenance, but recommend you do something called a flex test with new or older arrows. 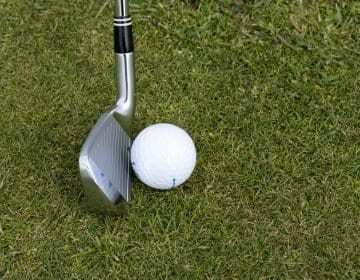 After each shot or with any new arrow, simply take your fingers and run down the length of the arrow shaft. Check for splinters, splits, nicks or anything that “feels” off, and discard the arrow if it isn’t up to snuff. Never fire a damaged arrow, and always check out your equipment beforehand –even if you’re just hitting the backyard for practice. Just because you didn’t dry fire your bow, doesn’t mean someone else wasn’t monkeying around with it. It’s better to be safe than sorry, and you can pick up more safety tips here if you’re just starting out. If you’re still with us, you can see we kept our list short and sweet as we felt these recurve bows provide the best bang for your buck. There are some other fine options available as well, but most we felt were too similar or lacking in terms of build quality or customer care. No matter which bow you choose, always remember to stay safe whether you’re in the woods or popping paper targets in your backyard. We felt the Southwest Archery Spyder stood apart from the rest due to its price and the overall quality of the bow itself. It’s very well-made with all the attachment points you could ask for and comes in a wide variety of draw weights as well! We hope you enjoyed our choices and gained some knowledge from our guide. While a few models didn’t quite make our list, we included an option and size for everyone. If we missed your favorite, feel free to let us know in the comment section below. Why is dry firing so bad for your bow? A “dry fire” is when you pull back the string and let it loose without an arrow. Just like with firearms, you don’t want to dry fire a bow and for the same reasons. It can damage the bow or your body – just don’t do it. Can I leave my bow strung when not in use? Only for short periods of time. If you plan to let your bow sit for over a week, you should unstring it until you’re ready to roll. That said, don’t go overboard as constantly stringing and unstringing a bow will put unnecessary stress on it as well. What does the phrase, “know you target” mean? Whenever you hear this phrase, it means to understand what you’re shooting at, and know what’s behind it. An arrow can ricochet or splinter, just like any other projectile. You always want to know the area around and behind your target before ever letting an arrow loose. Can someone else shoot my bow? Excellent question and an area where you’ll want to proceed with caution unless you’re of a similar size. 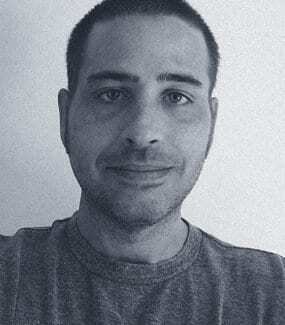 Someone 6’4” will have a longer pull than a 5’8” archer so be careful if the friendly neighborhood giant wants to try out your new bow or it may end up broken.